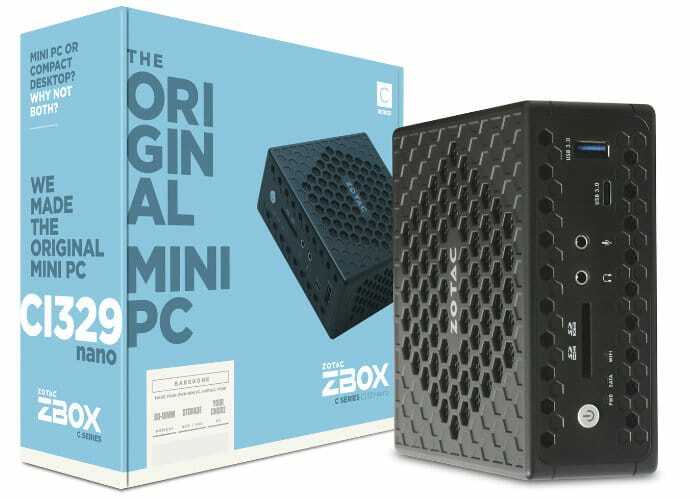 Hardware manufacturer and mini PC maker Zotac has unveiled a new passively cooled mini PC which extends the Zotac C Series of systems and is designed to provide a more capable and energy-sipping ZBOX Mini PC. An Intel Gemini Lake processor powers the new ZBOX CI329 nano with an integrated Intel UHD Graphics processor. The small mini PC is equipped with a variety of display outputs including DisplayPort, HDMI, and VGA and is capable of 4K Ultra-HD resolutions @ 60 Hz. Other ports include 5 x USB ports, SDXC card reader, Headphone and Mic jacks, dual Gigabit Ethernet ports and connectivity provided by both 802.11ac wireless and Bluetooth 5.0. Unfortunately, no information on pricing or worldwide availability has been released as yet by Zotac, but as soon as news comes to light, we will keep you updated as always. For more information and full specifications jump over to the official Zotac website.